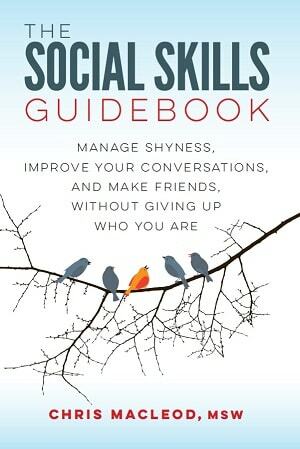 A core problem for many socially awkward people is that they have poor self-esteem or self-confidence. That's often what initially spurs them to seek help. They feel their lack of confidence contributes to their social difficulties, not to mention they just want to feel better about themselves. The topic of self-esteem is complex and I can't go over everything about it, but this longer article will cover what I feel are the most important points for improving it. As you'll see, there's no one path to increasing it. Rather there are many things you can do that will all add up. The suggestions are focused on increasing your core-self-esteem, not on quick fixes. I owe some of the ideas to the book The Six Pillars of Self-Esteem by Nathaniel Branden. I recommend checking it out. I'm completely simplifying things here, but when it comes to people who are socially awkward and who have poor self-esteem, you can divide them into two rough categories. The first are people who had more or less stable, supportive home lives growing up, but lack self-confidence because they were never that successful when it came to socializing. Again, I'm making things much more cut and dry than they are, but you could say their social problems are the main thing getting in the way of their self-esteem. If you're in this category you should be able to make improvements if you follow the upcoming suggestions in this article. The second type also aren't doing well with other people, and that hampers their self-confidence, but their lack of self-esteem goes much deeper because they didn't have happy childhoods. They grew up in an emotionally unhealthy environment and possibly experienced abuse or trauma. Even if they suddenly solved all their social issues tomorrow they'd still have deep-seated issues with their self-worth. To feel better in the long run people in this category will need to do more than address their social difficulties. They'll need to process and come to terms with the negative events in they went through as kids, and the way those incidents affected how they see the world and themselves. It's beyond the scope of this article to go into it, but there are a lot of books and websites that cover healing from trauma, abuse, and growing up in a dysfunctional home. Many people also find it helpful to see a counselor or attend a support group. I think the foundation of good self-esteem is realizing you're okay the way you are. People sometimes imagine that if they had high self-esteem that they'd feel really cocksure and amped up all the time, but it really feels more like a deep, solid level of comfort with yourself. You're aware of your personality traits and quirks, and your strengths and weaknesses, and are fine with the overall package they add up to. Inherent in the practice of self-acceptance is realizing that it's alright to be a regular human who makes mistakes and isn't perfect. Everyone gets things wrong sometimes, and it's not a sign that they're useless. Self-acceptance means setting realistic standards for yourself and letting go of perfectionism. People with low self-esteem sometimes believe they won't be able to feel good about themselves unless they become an overachieving superhuman. Self-acceptance also entails being nice and compassionate to yourself. It means being on your own side. If you make an error you can look at it with an understanding eye, rather than tearing into yourself. People who don't have self-acceptance tend to chase outside sources of validation. They think they'll be confident once they make more money/become more powerful/get more people to like them, etc. However, even when they earn these things they only feel good about themselves for a short amount of time before they set their sights even higher. Being self-accepting doesn't mean you have to condone or approve of everything you do wrong, or embrace all your flaws. However, if you do make a mistake, as everyone does from time to time, it's okay, and you don't need to disown your entire self. Being self-accepting doesn't mean you need to jettison all desire to change or improve yourself. You can be self-accepting while still acknowledging there are areas you'd benefit from working on. The well-known saying is that you're fine the way you are, and there's always room for improvement. The difference is when you're self-accepting personal development is something you choose to do, because you see how it will add to your life, rather than something you feel you have to do, to stay a few steps ahead of your supposed intrinsic shamefulness. Similarly, being more self-accepting doesn't mean you'll become complacent and lose all desire to grow and achieve. If something is truly important to you you'll still go after it. However, you may find yourself losing interest in goals that were only a means to gaining faux self-esteem (e.g., someone may retain their desire to become an artist, but become indifferent to owning a $15,000 watch). Along with being important in its own right, this point may help you develop self-acceptance too. A core reason people develop low self-esteem is that at some point in their lives they came to believe they were fundamentally defective. Usually this is because of messages they received and took to heart when they were young and impressionable. These 'messages' can come from the words and behaviors of people close to you, and how you interpreted them (e.g., a father is an emotionally volatile addict, and his children take it to mean there's something wrong with them). 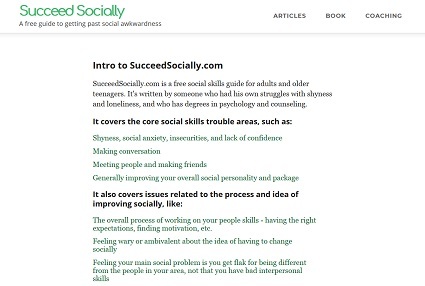 There's something wrong with you if you're not effortlessly socially savvy. There's something wrong with you if you're not that naturally sociable and like spending time alone. There's something wrong with you if you're not super popular. There's something wrong with you if you ever feel shy or unsure of yourself in social situations. There's something wrong with you if you don't have a giant group of friends. There's something wrong with you if you have quirky, non-mainstream interests. There's something wrong with you if you've got a unique worldview, sense of humor, or style of socializing. There's something wrong with you if you're not athletic and don't like team sports. There's something wrong with you if you don't have the right body type. There's something wrong with you if you don't always act like a traditional 'man' or 'woman'. You're not a worthwhile person unless you achieve a ton in your life. You're not worthwhile as a person unless you make a certain salary. You're not a worthwhile person unless you have a professional, white collar job. You're not worthwhile as a man unless you've had a lot of sexual conquests. You're not worthwhile as a woman unless you get married and start a family. How these messages are wrong and potentially damaging is that no one's intrinsic worth is lower because they don't meet their criteria. Someone isn't automatically useless just because they don't have a lot of friends or the right job. Is a doctor who's devoted to her life to operating on premature infants a loser just because she sometimes feels shy at parties? Of course someone may prefer to have more friends or a higher paying job, and recognize the benefits they provide, but that's different from believing they're an inherent failure for not having them. Many people feel bad about themselves socially because somewhere along the line they swallowed messages saying there was something fundamentally wrong with them because they're shy/a loner/awkward/not into sports/etc. It added up, all those times their classmates picked on them for being weird, or when their parents gave concerned, disapproving looks if they chose to stay in and read about aviation instead of playing basketball with their neighbors. As inconvenient as it can be, there's nothing really wrong with being shy or awkward or non-mainstream. Whatever messages they received, people with low self-esteem believe them in a very strong, unthinking way. They can increase their sense of self-worth when they start to identify, question, discredit, and stop living by those messages. Getting past the beliefs that arise from an unhappy childhood is a huge topic and beyond my pay grade so I won't try to go into more detail on that. Like I said though, there are a lot of other resources devoted to it. If your self-confidence issues mainly revolve around your lack of social success and all the flak you got for being different, the process should be a bit easier. The emotions around the messages you received can be strong, but they won't be nearly as charged or deeply rooted as those created by going through abuse or growing up in an emotionally unhealthy household. It's not as hard to be objective and pick out the socializing-related messages you've been living by that aren't a good fit for you. This likely won't be something that will come to you right away. Many socializing-related messages are so entrenched that they just feel right. If you're younger you may also need to gain more life experience and perspective before you can realize certain ideas aren't true (e.g., when you're still in high school your social status can seem like life or death. It's only once you're older that you can look back and see how inconsequential it really was). There's a contradiction at the heart of self-esteem. On one hand everyone has inherent self-worth that doesn't depend on their actions or accomplishments. Self-esteem comes from within. It's not something other people bestow on you, or a prize you earn after you've done enough things to prove to the world that you're worthy. On the other hand, self-esteem is partially affected by what you do. It acts as a gauge for whether you're living in a way that's important to you, and can't help but decrease if your life is not in a place you want it to be. It's just a facet of human nature that we care about these kinds of things. Increasing your self-esteem through your actions can be a tricky balancing act. You can build your self-worth through what you do, but there are traps you need to avoid. You don't want to come to feel your self-esteem depends on your accomplishments. I'll talk about that in a bit. Overall you could argue principles like these are hardwired into people. I think everyone varies in which ones they emphasize though. For example, one person may feel a strong pull to have a meaningful job, and lose confidence if they're just doing something to pay the bills. Someone else may be happy to take any old job, and put more importance on thinking for themselves. Living by these standards takes consistent work, and it's easy to unintentionally be led astray, so not perfectly fulfilling them doesn't mean you're a complete failure. Do your best, and be self-accepting of the times you don't get them right. You can increase your self-esteem by working to improve in any areas where you have weaknesses that bother you. This is particularly true since people's self-concept is more affected when they know they're missing something important, as opposed to when they gain a 'nice to have'. These weaknesses could be social problems like chronic shyness, poor conversational ability, lack of assertiveness, loneliness, and so on. They could also be issues in other spheres like your finances or career direction. Whatever your issues are, you should feel better about yourself once you get them under control. Once again, this is plainly a step that will take time, as you can't make sweeping changes to your life in a few days. Though if you were previously directionless and discouraged, even just having a basic 'action plan' for how you're going to start working on your issues may improve your self-concept a bit. It's only natural we'll feel a sense of self-worth if we have some things going for us. Take time to develop your existing positive traits, or work to attain new ones. This could involve trying to cultivate certain aspects of your personality, or practicing to learn a new talent. You can't help but feel more confident if you've had some successes. Every person will set different goals depending on what's important to them. Challenging ourselves also increases our feelings of self-efficacy, that is the sense that we're generally flexible and competent and can handle what life throws at us. All else being equal, who's likelier to have good self-esteem? Someone who works a degrading job, and whose 'friends' and partner constantly put them down, or someone who has supportive, encouraging people in their life? Again, on one level your self-esteem shouldn't depend on what other people say about you. We should be able to brush aside the inaccurate, hurtful things they say. On another level we're all human, and if we're constantly undermined and insulted it can't help but affect us. You can start to feel that your self-esteem depends on achieving certain things. If you can hold onto a certain state (e.g., having a high-prestige job), or keep continually accomplishing particular goals (e.g., having new people like you) , then you feel good about yourself. Otherwise your self-esteem falls apart. You can see self-esteem as something you compete over. If you can beat other people in a particular area you 'win' it. If they beat you, you lose it. Your achievements only give a fleeting boost to your confidence. After that you feel insecure again and need another fix. You can feel like you have to achieve certain things in order to 'prove' you're not a loser any longer. You can unconsciously construct an idealized persona and dream life to chase. You think you're worthless until you get that, and that if you attain it you'll live happily ever after. People who chase external sources of self-esteem sometimes rack up a lot accomplishments. However, they're never able to really enjoy their successes. You need to have a solid foundation of self-acceptance. If you don't accept yourself at a core level then everything you do will be an attempt to cover up or overcompensate for what you feel is your flawed true self. That's not to say you should put all your goals on hold until you become 100% self-accepting. Try to cultivate it at the same you work towards them. It helps to be aware of the false, harmful messages I mentioned earlier. Many people chase external sources of self-esteem because they believe messages telling them they need to go after these things. Try to be aware of why you're striving for something. Could you live without it, but it would still be nice to have? Or do you feel you must have it, otherwise it shows something is wrong with you? When people have poor self-esteem they often have distorted thought processes that sustain it. For example, someone's co-worker may not respond to a text inviting them to hang out and they'll quickly conclude, "It's because they hate me. I'm a loser. I'll never have friends." You can prevent some of that damage by learning to recognize and dispute these thoughts as they come up. This suggestion isn't a complete method for improving self-esteem on its own, but it can help tidy up your thinking when combined with other approaches.